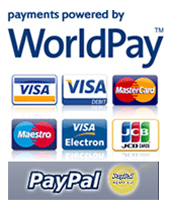 Press the CD button twice or use the MODE button on your steering wheel to access the USB MP3 player. The LCD will disply EX1:1 or CD1:00 when the USB MP3 Player is selected and USB device is attached. If there is no USB device attached or if there are problems reading the USB device, the display will read EX8:88 or CD06:88. If the proper folder structure (detailed below) is not present, the display may flash "NO DISC". If you have a USB storage device attached, the USB MP3 Player will begin to play songs from the designated folders on the device. Songs must be placed in designated folders on the flash drive. The folders must be named CD01,CD02, ...up to CD10, though some vehicles, such as Mazda 6 will support up to CD10. 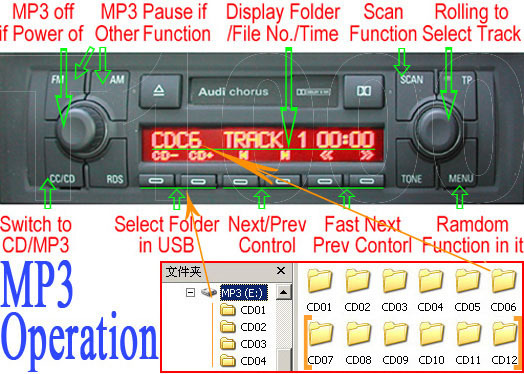 When the flash drive is plugged into USB MP3 Player, each of these folders is recognized as "disc"- meaning it starts in the CD01 folder, and if you press DISC+/- (some vehicles using numbers 1,2, ... 12), it will change to the other folders. The USB MP3 Player will recognized up to 99 songs for each folder. This allows you to organise your music more easily. You may change tracks by using the steering wheel controls or the seek buttons on the center console. The timer on the LCD will be accurate for each song. The random button can be used to play songs in a random order. If you change tracks while you are in random mode, the next track in the playlist will be selected and random mode will be canceled. If you are in random mode and you would like to switch to another random song rather than the next song in the playlist, you should press the random button twice. If you have a cable plugged into the 1/8" stereo plug, the USB MP3 Player will stop playing songs from the USB storage device.